Is Burning Wood Really A Long-Term Energy Descent Strategy? 1. Wood burning is not carbon neutral. 2. There are serious health implications from the smoke produced from wood burning, even from ‘clean’ burners. 3. Basing home heating requirements on wood burning requires a large area of dedicated woodland managed as a fuel wood. In terms of carbon neutrality, the burning of wood often ignores the fossil fuel used in the harvesting, preparation and transporting of wood. The carbon dioxide released when burning wood (about 1900g CO2 for each 1000g of wood burnt) is balanced by the fact that this carbon was taken up by the tree from the air when it grew. So this part of the emissions is carbon-neutral. However, many other chemicals are produced when wood is burnt, including one of the most potent greenhouse gases, nitrogen dioxide; although the amounts may be small (200 g of CO2 equivalent per kg of wood burnt), the gas is 300 times more potent as a greenhouse gas than carbon dioxide and lasts 120 years in the atmosphere. Methane is also produced (70 g of CO2 equivalent per kg of wood) – 21 times more potent than CO2. Carbon monoxide is also produced in large amounts which has an indirect positive effect on global warming. Recent research suggests that particulates too have a positive effect many times greater than the combined gases although they are short lived. Overall, although figures vary depending on a multitude of factors, there is no doubt that wood burning is contributing to global warming. The health implications of wood burning derive from the emissions which contain carbon monoxide, nitrogen dioxide and particulates, as well as other noxious gases. In a rural situation, where the burning inside a building is clean and with a flue, the health effects will be minimal. In a situation in a village, town or city it is not so: ambient levels can rise severely (for example, in Christchurch, New Zealand, where wood burning is common, wintertime levels of particulates can become very high, causing an estimated 100 deaths a year and an increase in hospital admissions from respiritory complaints by 8%). An estimated 1.5 to 2 million people die per year worldwide from indoor smoke, mostly produced from open and unflued fires in the ‘developing’ world. Smoke particles in the EU (from wood and fossil fuel burning) reduce average life expectancy by 8.6 months. As to the area of woodland required, this is a less contentious issue. It depends, of course, on the type of building being heated – a newly built ultra efficient house will require much less than an older house. And if heating and hot water are both being generated by wood burning this will increase the requirement. A recent case study of a new build with heating and hot water from wood burning estimates a requirement of 12 tonnes/year of dry Douglas fir, equivalent to about 9 tonnes/year of a denser wood like ash. Forestry Commission figures estimate 8 tonnes/year of air dry wood to heat a three bedroomed house. A 10 year fuelwood coppice rotation of mixed deciduous trees produces about 1 tonne/acre/year (or 2.3 tonnes/ha/year), so 8 acres of coppice would be requires to produce 8 tonnes of wood per year. Even the fastest growing trees – alder, willow, poplar, eucalyptus – would require 6 acres to produce 8 tonnes of wood per year. For the 30 million households in Britain this would require about 4 times the total agricultural+forestry land area available! 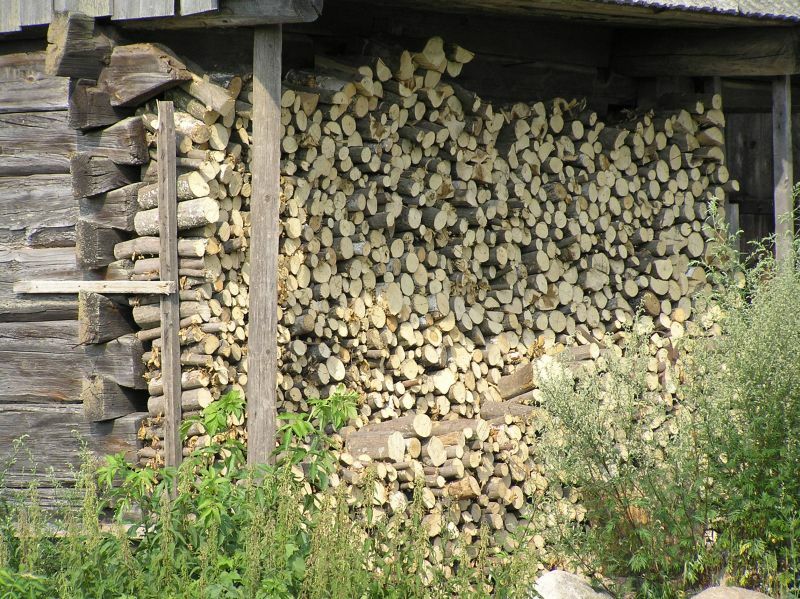 Nobody is suggesting the entire population of Britain use wood fuel, however, it is clear that in an era when food will need to be grown more intensively, more locally and more sustainably, there will only be enough land for a small minority to use wood for fuel. Domestic Woodfuel Installations – A Case Study. Scottish Woodfuel News No 3, Nov 2007. The ‘carbon neutral’ aspect of wood burning has always seemed a bit dubious to me. If we agree that right at this moment there is too much CO2 in the atmosphere, then it is clear that burning wood will add to it. Yes, the same amount may be reabsorbed over the coming years by further plantings, but the CO2 is being released right now when we already have too much. And we have to be absolutely certain that a tree will be planted for every one we burn and that it will grow to the same age. It seems a bit like carbon offsetting but without the cynicism. I question the reason for space heating. If the reason for warming a space is to warm ourselves, then why don’t we warm ourselves directly and according to our own specific needs? A moxa box strapped to our back (over the ming men point) to invigorate our own internal fire may be sufficient enough. Before we installed our woodburner we looked into all the problems raised in the article Rob quotes. We eventually settled on buying the most efficient clean burn technology we could afford, we use foraged wood from the village (haven’t paid for any since installation).Most of it is brought home in the wheel barrow or picked up in the car as part of another journey so we don’t have the transport miles. It’s not a solution to everyone’s heating problems and lots of people won’t take to wood anyway, the faff, the dust etc but it works for us, heating our 3 bedroomed (highly insulated) bungalow very efficiently. If we had the land we’d coppice, but for now we’re managing with windfalls resulting heavy winds, which otherwise would be chipped and driven away by a tree surgeon. For me it still has many advantages over coil or oil, but I have never regarded it as a climate neutral form of heating. The same argument is true of wind power, solar power, tidal power etc. of course. Taking the full lifecycle into account none of them is currently truly carbon neutral, but they are still a vast improvement on more carbon-intensive energy sources like fossil fuels and nuclear. This suggests that 7.5 million households would be more a more sustainable number of households – and a UK population decrease from the current 61 million people to 15.25 million people? Permaculture would appear to have an important role to play. We have installed a Morso Badger woodbuner plus a Rayburn that does the central heating, hot water and cooking in our 4 bedroom Victorian terraced, urban house. We never had central heating before, and relied on inefficent gas fires for most of our heating, as well as those little portable electric oil filled heaters for the kids’ rooms in winter. For the first time in 14 years we feel comfortably warm in winter throughout the house! As we were installing from scratch rather tahn adapting an existing gas fueled system, and, thanks to a legacy, were in a position to afford to go for the wood fueled back boiler option. Later this year we are planning to install solar panels to do the hot water in the summer when the Rayburn won’t be in use, and hopefully do most of our summer cooking on a rocket stove in the garden. Hopefully by the end of this summer we will be completely off the grid as far as heating and cooking are concerned, we’ve already had our gas cut off. Our installer has a commitment to being as ‘carbon nuetral’ a business as possible, and supplies most of our ‘good’ wood, harvested from local woodlands about 3 miles away, properly seasoned and hand processed. He has been very supportive of Transition Town westcliff, including hosting an exhibition of my artwork themed around a local orchard, and is also hosting a talk on wood energy for TTW in July. He’s also been talking about getting a horse and cart for deliveries since attending and being inspired by a TTW meeting! Apart from that we get wood for burning off of skips, etc… At the moment we’re trying to organise a storage system as donations from neighbours, etc, of old fences, scrap wood, etc has been overwhelming our garden. Wood burning isn’t the solution for everybodies heating needs, and as I said above the instalation of such systems are probably well beyond the financial means of most people (we were extremely lucky to have been left some money by a relative, or also wouldn’t have been able to afford it, so I’m certainly not saying ‘everyone should get a woodburner’). But surely wood burning is part of the picture for a post-peak oil energy future, along with other options like wind, solar, etc, and surely giving much more land over to planting trees for fuel (as long as its sustainably managed of course! And with intelegent agroforestry design we could be mixing fuel production along with food and medicine production, timber for building and other uses surely?) is a GOOD thing??? All energy sources are bound to have some costs and downsides, but on balance I feel that what we are doing in our house is a better option than continuing to rely on grid based electricity and gas. I must say that this article does seem rather long on problems and short on solutions – what does Martin propose as a better answer? Shall we just cull 90% of the human population and be done with it? I get utterly sick of seeing articles like this, bleating on about how green technology isn’t perfect. It’s like reading “The Ecologist”, my latest substitute for toilet paper. How much methane is produced by burning the wood in comparison to letting it rot? I bet there’s a lot less. Or how about putting rotting wood in a biogas digester – though I’d hardly see that as being at all practical. I note from a couple of the above posts some concern that the article presents more problems than it does solutions, as if this is an unwelcome approach. It’s very unrealistic to expect people who are capable of raising objections to certain processes or lifestyles to also be capable of finding the solutions. The objectors have an extremely important role to help move the debate another step forward and focus the solutionists onto areas they may otherwise have overlooked. Well let me offer an analogue. In Software Engineering there is the term “Analysis Paralysis”. Such paralysis is already rife in the climate change and energy depletion debates. To me it’s more a question of what’s the lesser of two evils. Burning wood may not be carbon neutral (I never thought it would be) but it’s a lot lot better than using non-renewables. Of course there needs to be debate on where techniques could be improved, however, all too often we’re seeing minor problems being blown out of proportion so that projects get delayed or cancelled. We’re not going to get Transition right first time; let’s not stall ourselves with intellectual masturbation! I really don’t abide the objectors to renewable energy, especially when they are environmentalists (instead of the NIMBYs). It’s as though there’s a fraternity that strives for perfection but performs U-turns at the first hurdle. Point taken Ben, and maybe I’m being a little defensive having just spent 10 grand on a wood fueled heating system only to be told that it’s not carbon nuetral, its polluting, it uses far too much land, and probably isn’t really a viable long term energy descent strategy, without being given any suggestions of what a better way might be that will work in the cool temperate UK. It does sometimes feel that whatever steps one takes to make a difference in reducing ones carbon outputs and reliance on fossil fuel, there will always be a critical voice somewhere saying “well thats good enough, you are still part of the problem not part of the solution”. Seriously, I would like to know what to know what realistic options will be available for heating and providing energy in the coming age of Transition if wood fuel is not included in the picture. Will it be solar, wind and wave power only? Surely these too have embodied energy implications in their production, as well as the processing of raw materials, transportation, land footprint implications, disruption of ecosystems and so on. The onus might not be upon Martin to provide solutions (although your argument here does somewhat remind me of the tradition enviromental activist approach of giving out loads of doom and gloom figures about climate change and peak oil, then leaving the audience in a state of paralysis, fear and disempowerment without suggeting any ways forward – hey, we’re just doing our ‘raising awareness’ job!! ), but the article could at least put wood burning into a context of where it might stand on a ‘least worst’ scale of how we might fuel our post-oil futures?? Question to Rob – so are you still going ahead with installing your woodburner? Ah! I was waiting for that one… yes I am. I agree with Shaun that there is no such thing as a carbon neutral fuel (other than passive solar) when you take all the inputs into consideration. Clearly the most important place to start is in insulation and efficiency, and we are doing the two things in parallel. I think, as you pointed out Graham, heating with wood isn’t for everyone anyway, some people are “I’m cold, I’ll flick a switch” people, and some are “I’m cold, I’ll light the fire” people. I have been the latter for years, and I’ll go with that. My sense is that if in 20 years we have most of the cars off the road, and a significant proportion of the population burning well seasoned wood in highly efficient burners, we’ll have far cleaner air… but then I may be wrong. To me, burning locally sourced wood feels like the right thing to do,but that’s not necessarily the most sound basis for decision making! So yes, we are planning for solar panels with a hot water tank and a wood stove with a back boiler. Energy efficiency is of course the important point I missed in my earlier posts – I forgot to mention that in tandem with putting in the wood fueled system we also majorly upgraded the insulation in our house, replacing draughty, rattling and rotting 100 year old sash windows with new wooden double glazed sashes – again, an expensive option, but we didn’t want to use PVC, and whilst the money is there, and its unlikely that we’ll ever get that sort of opportunity again, it seemd the best way of usng it. I doubt that in ‘payback’ terms we’ll ever cover the costs of the work we’ve done on the house in the last year or so on savings on our power bills, but as a permaculturist I’d like to feel that our house will act as a model of what can be achieved even in a highly urbanised situation such as Westcliff on sea. To me, burning locally sourced wood feels like the right thing to do,but that’s not necessarily the most sound basis for decision making! My New Year’s Resolution a couple of years ago was to trust my intuition and stop letting logic from getting in its way. Something is always overlooked or biased when applying logic, whereas gut feel employs unconscious thought. Clearly the Forestry Commission aren’t experts on houses, though they might know a thing or two about wood. Surely if we embrace the Passive House standard for new build, that figure of 8 tonnes/year should be reduced to, erm, zero. First a response to Jason. I did not say in my article that I am against renewable energy or indeed against burning wood. If you want to criticise an article please base your criticism on what has been said as opposed to your bias. I wrote the article simply to point out that for everybody to burn wood for space or water heating is just not an option for various reasons. Seeing as space heating uses a lot of our overall energy consumption this means that the energy needs to come largely from somewhere else. However don’t let me stop you sticking your head in the sand if you wish. Re sustainable population, the bottom line is that world population is already way over the carrying capacity of the planet. Whatever form of energy is used – wood, fossil fuel, renewables, nuclear etc – will not matter when there are 10 times as many people on the planet as it can sustain in the long term. You need to be planting much more wood than you are cutting down to be sustainable. Preferably much closer to the equator where new trees don’t reduce the reflective effect of the snowline. The main priority should be in investing to save existing equatorial trees, then planting out from there. And minimise the wood you use as fuel. Martin – I never (directly) said that you did; with that sentence I was merely expressing my generic frustration over society behaving like a rabbit staring at an oncoming car’s headlights. It’s just that the article appears to be full of negativity, when it could suggest that wood fuel, when done properly, can make a fair contribution to the overall energy mix, but don’t expect it to be a panacea for the reasons stated. I believe you have to be very careful about publishing articles citing a technique’s limitations; the media, pressure groups, and MPs tend to blow them out of proportion, and before long you’ll find that nothing gets done with any gusto whilst society drifts into the depletion abyss. For instance, a few years ago Greenpeace released an article on decentralised energy, making the misleading conclusion that “centralised electricity generation loses ~70% of the primary energy” so it should be avoided at all costs. This has led many people to question the merit of windfarms, for which only 7% of the electricity generated disappears into heating the National Grid. The Greenpeace article should have stipulated that “centralised thermal generation with no waste heat recovery loses ~70% of the primary energy”. The knock-on effect of the article is that scores of environmentalists have been walking around saying “centralised electricity is bad”. It’s not the centralisation that’s wasteful; it’s the use of thermal generation without heat recovery. Good luck with the wood burning stove Rob. You will no doubt be scavenging prunings and thinings from all those nut trees Totnes is planting. Remember this though – my dad always called the rubbish bin the ash can. In his day of wood burning on open fires, a real benefit was the ash – a great source of potassium (aka potash) for the graden. I don’t know if there is such a thing as peak potash – but it wouldn’t surprise me. When you do your carbon balance do figure in all the mining of potash that isn’t happening if you use your wood ash properly. Yes – I must say that I’ve been liberally applying the ash from the woodburner and rayburn around the allotment (although do remember once reading in a Lawrence D Hills book that care should be taken not to overdo it as apparently too much wood ash can unbalance soil nutrient and salt levels) I don’t know if its my imagination but the onions certainly seem to be larger than the last few years), so there’s another benefit! Very interesting stuff (both comments and article). From my reading I think that Jason and Martin pretty much agree with each other – just seems that Jason has experienced the unfortunate effects of the media twisting everything into a ‘one size must fit all’ mantra. I suspect that as resources deplete and whilst there are still too many people on the planet, we’ll just adapt pretty fast to being tougher again. Those figures of 8 tonnes of air dried wood per house per year already sound extremely luxurious to me!! Jason says above: ‘we’re not going to get Transition right the first time’ – a very important point. David Holmgren’s ‘Energy Futures’ scenario work emphasises this point – we tend to get caught up in the here and now but we must remain aware that the world will be a place of very fast change for the next 3 or 4 hundred years – it’s just that most of the changes will be in the opposite direction to what we have experienced for the last 300 years (population, pollution and energy use will all go down). Interesting discussion! I wonder if there’s a place for the development of domestic pyrolysis units which heat biomass in the absence of air. The volatile matter is driven off as gas and burnt to develop useful heat (driving the pyrolysis), leaving charcoal which can of course be burnt or retained as a way of sequestering carbon, making the process carbon-neutral or even carbon-negative. Of course retaining some of the carbon would reduce the net energy available per unit mass, therefore increasing the area that needs to be cultivated. The real key to keeping warm, of course, is good building design in the first place! May I remind you all that the very reason why England resorted to coal in the first place was because they were running out of wood? So wood -> coal -> oil & gas -> wood!!! If wood couldn’t do it for the population at the end of the XVIII century, what on Earth makes you think it can do today??? Pray that global warming is in earnest. Otherwise, back to Africa. I lived in a two-room straw cabin, approximately 750 sq. feet. Bales were stacked “Nebraska style” and walls were 18-20 inches thick. The roof was insulated with bedded straw between the ceiling rafters. Windows were single pane and doors were not weatherstripped. My woodstove was a Vermont Castings Intrepid-II, which has a catalytic converter. White oak and red oak has a heating value of 26.4 – 28.0 btu/cord. A green cord is 4890 – 6290 pounds, with 30-40% weight loss during drying. I am at 35.4° N 87.3° W but because of our altitude, we experience severe weather during winter months. Our first frost is mid-October and our last frost is typically at the end of May. Most of the days between those dates could require some use of the woodstove. Maximum cold temperature during that period was -23F (-32C). We get 8 to 20 inches of snow, usually. Because we have 200+ sunny days per year, an attached greenhouse is essential, although I confess, my cabin is deep in the forest and I did not add a sun room until this year. In conclusion, I would say that design of the living space is as important as any other factor. There are a good many designs these days for zero-energy buildings, and when one combines zero-energy goals with natural building techniques, the best of all results occur: warm interior space with minimal maintenance, energy use and impact. One other note I have on the post: when calculating net sequestration one must consider the tree’s roots. I defend my choice of wood heat as appropriate for where I live (inside a large forest which is well-zoned and caretaked), but agree that it is entirely inappropriate for many locations. Well, I can’t match Albert’s quantitative analysis, but qualitatively speaking I can say that we still haven’t finished burning the oak offcuts from the roof of our cob cabin, which we finished roofing in the winter before last. Even including all the scavenged wood we also got through, I’m reckoning less than half a tonne of not-particularly-dry wood in two winters. Mind you we’re talking about a 15 square metre cob cabin (i.e. very good thermal mass), in Northern Spain. Our climate is pretty similar to Devon’s, only about 3 degrees warmer… i.e. roughly what Devonians can be looking forward to in a few decades. By the way, climate change doesn’t seem to have been included in the analyses of heating costs in Britain – another reason why the estimates of wood required for heating seem to be overly pessimistic. We recently changed from an open fire to a closed steel stove, mainly for indoor air quality reasons. But we were unable to find a reasonably priced high-efficiency stove (one that burns the wood at a high temperature to minimise smoke). Ok, here is an example from the south west of Ireland: 4-Bedroom house with over 120 square meters, sheep-wool insulation, passive solar heating and masonry stove for space heating and warm water needs about 2 tonnes of wood (green weight). The masonry stove works on total combustion principle which produces a lot less greenhouse gases than normal wood stoves. Burning wood is always carbon-neutral, since it comes from within the biosphere, however it might not be completely climate-neutral. It certainly is a good solution for some people, but keep in mind there are no final solutions to the problems caused by over-population, except a painful reduction of the population size. I’m enjoying this blog – very informative, really helpful stuff (including Martin Crawford’s article). I’d be interested to read an article and discussions on population. Not that I don’t like people – there are just too many of us. The most efficient thing to do, to the best of my knowledge, is to insulate your home to the best level available (walls, ceiling, gaps, under floor etc. ), and double or triple glaze your windows THEN and ONLY then get the heater installed! I’ve lost track of the amount of homes I’ve been into where the owners complain about their heating bills, yet haven’t bothered to insulate or get double-glazing! Or there are those who walk around in T-shirts and complain its cold. Would these be the same people who enjoy taking cruise ship holidays to Antarctica whilst warming themselves under gas patio heaters? It would be useful to have direct web references for some of the statistics quoted – the production of methane and nitrogen dioxide for example. Also essential to distinguish between old fashioned log stoves and modern wood burning boilers. I find it hard to believe that methane can get through a modern boiler unscathed – this is methane, CH4, natural gas! Also be clear on the various oxides of nitrogen. NO2 – nitrogen dioxide – NOT a greenhouse gas but a contributor to smog. N2O – nitrous oxide – the potent greenhouse gas. So which is it? Oh goodness, hang on a second, haven’t you folks ever heard of gasifier stoves? They keep the methane from being released — keep it and burn it instead. They use a very small amount of wood and get two heating cycles out of it. Google it! Installed an Esse wood burning cooker and solar panels last year. Use this and a Joutel wood burner to heat a 4 bed semi stone built 150 year old cottage. Have cavity wall insulation where walls are new old walls are 3 foot thick, extra loft insulation, half windows double glazed saving for others, all floors insulated. This system keeps us sort of warm with jumpers vests blankets 2 pair socks and hot water bottles in the winter, provides 3 showers a day and water for washing up and all cooking from scratch including bread, jams etc. Wood supply is difficult as the flu can get damaged by wet tarry wood, we collect some of ours from where it is unwanted and buy rest from sustainable cartel. We had to build a second v large shed from recycled timber to store the wood in,we have to carry wood around every day which helps keep us warm and fit. THis works for us, but we have room and live in the country I don’t think it could possibly be the solution for everyone. There will be many solutions the important thing is to accept that it will take time, faith and dedication to find them. All we need is for everyone to work towards doing something better than what they are doing today. As far as the population goes I really feel that we have to work towards population targets which take into account what the country can reasonably sustain in an eco friendly way. Anything else is madness and ignores the right of the other creatures with which we share this planet. 3) We should not get to hung-up on carbon neutrality – research by the Forestry Commission suggests that wood collection and transport typically accounts for between 2%-4% of overall carbon account.